Description: Train 588 crossing the Mississippi River. Description: An awesome looking rebuild is 3rd out on the HAT this morning. 6054 led. Description: The Red Wing switcher rests in front of one of the grain elevators in downtown. Description: The Iron Horse hotel built along with the Harley Davidson museums is just east of Sprecher RxR. Description: Sitting at the shops. 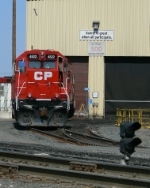 Description: CP rail TEC train power. Description: CP 4522 leads Transfer 1 up towards Lexington Ave before heading back to Saint Paul. Description: Soo 2016 gets ready to head up to Spur 17 to grab some boxcars before heading back to Cardigan. Description: Transfer move at Franklin Park. 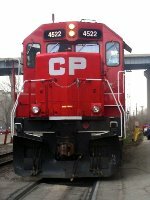 #4522 is a former GP40X rebuzilt to GP38-2 specs. Description: flared radiators and an S-3L? Make it a C-C and you've got pure win! 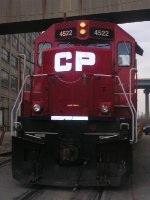 Title: CP 4522, CP's Tomah Sub.